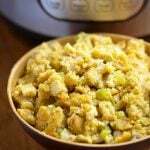 This Instant Pot Cornbread Stuffing is fluffy and tasty! It has a savory and sweet thing going on as the cornbread has a little sweetness, and the onion and spices have the savory. The results are delicious! 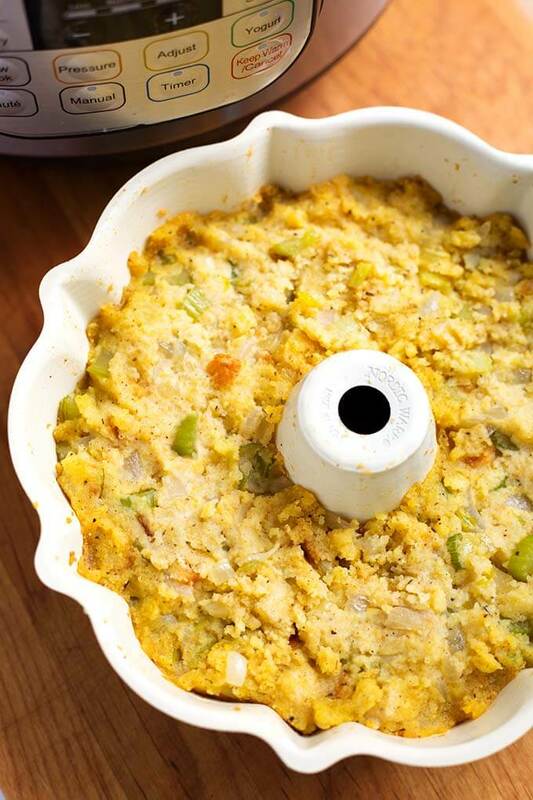 Pressure cooker cornbread stuffing might be a new favorite! By the way, do you call it stuffing or dressing? We’ve always called it stuffing. I’m bringing you a few ideas for Holiday side dishes (or any day!) that can be made in your Instant Pot. Stuffing is what I look forward to the most every year at Thanksgiving! I have always loved the traditional version made with little cubes of dried bread, some butter, turkey broth, and lots of sage! 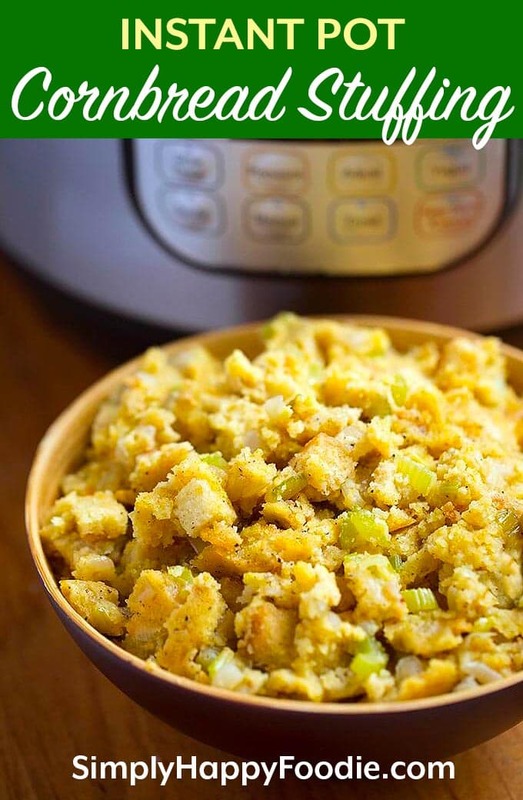 That’s the way I like this Instant Pot Cornbread Stuffing, too! The cornbread adds a nice bit of sweetness that plays well with the savory flavors! If you want to make it more hearty, you can mix in some cooked crumbled sausage! Sausage and sage go very well together! 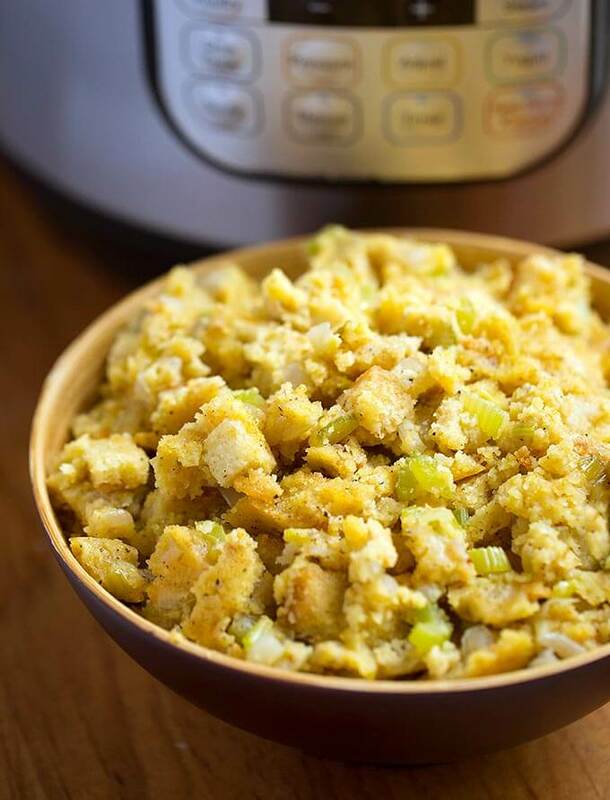 The best method for making Instant Pot Cornbread Stuffing is to do it using the PIP (or Pot in Pot) method. That’s when you cook the food in an oven safe dish within the pressure cooker’s pot, on a trivet/rack. The water is below the dish of cornbread, so it won’t get wet. This method is good for thick foods, cheesecakes, and food that you don’t want to get watered down, as you need water to make steam that brings the pot up to pressure. I have two preferred pans for making Instant Pot Cornbread Stuffing in. The first is the Nordic Ware 6 cup bundt pan. This pan is great for this size of recipe. The pan is also good for cakes and even my Southwest Biscuit Egg Bake recipe. The other pan I like to use is the ekovana Stackable Stainless pan. This one comes in a set of 2, and is just shy of 2 quarts, making it perfect for a double batch! I also use the ekovana pans for Scalloped Potatoes, and Corn Pudding, among other tasty dishes! Instant Pot Cornbread Stuffing is the perfect Thanksgiving side dish. Fluffy cornbread flavored with sage and butter, and cooked in your electric pressure cooker. Break up the cornbread into a mixing bowl and set aside. This can be done ahead of time if you want it to dry out a bit first (fresh cornbread will yield a softer stuffing). Turn on the Sauté function on your Instant Pot (Normal, Med heat) and add the butter, onions, celery, sage, poultry seasoning, salt, and pepper. Cook, stirring frequently, until vegetables soften. Add the garlic and sauté with the vegetables for a couple of minutes. Add the vegetable mixture to the cornbread and stir. Add the turkey broth to the cornbread and combine. Put the cornbread mixture into a sprayed 6 cup bundt pan, or a metal pan, such as the ekovana Stackable Stainless Pans. Cover the pan with foil and seal it well. Rinse out the inner pot, dry it, and put it back in the pressure cooker. Add the water and a trivet/rack to the inner pot in the pressure cooker. Use a sling* (or a rack with long handles) to lower the pan into the pot. Fold over the ends of the sling to get them out of the way. Make sure they don't block the steam valve. Close and lock the lid in place, and set the Steam Release Knob to the Sealing position (on the Ultra, just close and lock the lid). Press the Pressure Cook/ Manual button, High Pressure, and choose 18 minutes using the + or - buttons (or the dial on the Ultra). When the cook cycle has ended, do a Quick Release of the steam by turning the steam Release Knob to Venting (or push the button on the Ultra). When all of the pressure is out and the pin in the lid drops, open it and remove the pan to a cooling rack. Leave the foil in place and let it sit for 5 minutes, or while you set the table and get everything else ready. Usually made with aluminum foil, used to get the pan in and out of the pressure cooker easily. Fold a 28” length of foil along the long end 3 times. You will end up with a sling that is 28” x 3” (folding it gives it strength). This was so delicious! I added some cooked crumbled sausage and it was a big hit. That’s great, Tina! I’m so glad you liked this recipe! Hi Shannon! Ground sage is made by grinding the leaf into a fine powder. Rubbed sage is made by rubbing dried sage leaves to make it light and fluffy. Rubbed sage is lighter and less concentrated so a teaspoon of rubbed sage will be less intense than a teaspoon of ground sage. Thank you for the nice words, and See you around!